Juliet Schor is Professor of Sociology at Boston College, MA, US. 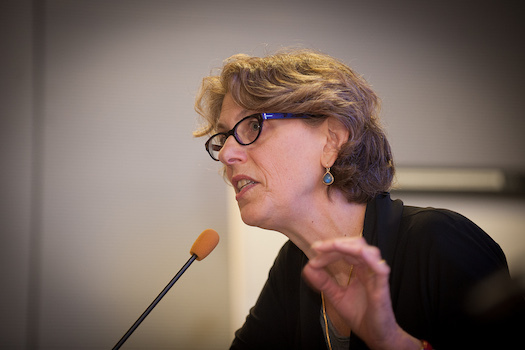 This is the text of her address to the INET CORE Project workshop on 11 November 2013. Forty years ago a group of engineers and scientists at MIT began warning about the impacts of global economic activity on planetary ecosystems. They published a bestselling book called Limits to Growth in which they predicted that, if we continued with what we now call “business as usual”, there would be severe economic and ecological repercussions in the opening decades of the 21st century. While the economists won the battle, including a famous bet between Paul Ehrlich and Julian Simon about what would happen to the prices of non-renewable resources, they lost the war. Climate science has unequivocally found that we are on a dangerous path of anthropogenic global warming. The Fifth IPCC Assessment Report (summary), just released, finally calls attention to the profound contradiction at the core of the climate situation: the world’s stated commitment to 2C or less of warming implies that more than three quarters of proven fossil fuel reserves are unburnable. We’ve either got a carbon bubble that will make the housing bubble look trivial, or we’re already off the climate cliff on our way into chaos. What happened in the 1970s set back the process of reforming economics by decades. The analytic treatment of environmental impacts of economic activity as “externalities” resulted in a literal externalisation of the topic from the core of the field. The last time I surveyed top economics departments in the US, which was a couple of years ago, I did not find one that had more than a single environmental economist and a number had zero. (Some of these are departments of 50 to 70 people.) A search of the most influential economics textbook in the United States, Greg Mankiw’s Principles of Economics, finds one mention of climate change, and an incidental one at that. It took until 2006, and the publication of The Stern Report, to shift the balance of opinion among economists toward the view that we should take significant action now to address climate change. Climate change is the most significant economic challenge in human history, and it has profound implications for eco-system functioning beyond the climate system. What does this imply about how we should be teaching introductory economics? The first point is a simple one, well known to you I am sure. But it’s worth repeating. The definition of the economy must begin with the fact that it is a sub-system of the bio-sphere, and that economic activity must ultimately be sustainable with respect to that bio-sphere. This is the core insight of ecological economics. The flows of energy and materials between the human economy and the bio-sphere must be identified as part of the circular flow at the beginning of any economics course. Similarly, identifying which of these flows GDP includes and excludes is imperative. I also recommend, for their heuristic power, including ecological and carbon footprint accounting alongside GDP. The analytic treatment of environmental impacts of economic activity as “externalities” resulted in a literal externalisation of the topic from the core of the field. In standard accounts, climate change is not particularly analytically interesting. Understood as the largest market failure in history, one just internalises the externality. Seen as a classic case of an open-access commons, it leads to an inevitable tragic outcome. But new economics yields at least two other ways of thinking about climate and eco-systems which should be at the core of teaching. The first is the importance of the material world, and especially energy. There is now considerable research on the central role of fossil fuels in the explosion of productivity and output since the mid 19th century. This research tends to be disconnected from conventional models, and is rather atheoretical, but it is crucial to integrate the influence of energy and material flows into the core of economics. The abstraction that characterises standard theory and teaching has been part of the discipline’s myopia with respect to specificities of resource use and sustainability. There is an emerging science of material flows analysis, based largely in Northern Europe, which needs to find its way into economics teaching. To put this point more bluntly: since the mid 20th century, economics has been too heavily “idealist,” as in Solow’s famous discussion that I mentioned above. It needs to return to its earlier, more materialist orientation. The second point about studying climate change is that it has a lot to teach students about more general theoretical concepts such as interconnectedness and power. Humans share a biosphere, and it is now possible for people in one part of the world to inflict profound, even mortal, harm on those elsewhere. Of course that is at the core of the climate dilemma. There is also the power of vested economic interests—in this case, fossil fuel producers—to wield enormous political power. In the US, they have been able to put enough climate deniers in Congress to prevent all legislative efforts to price or cap carbon. In my view, that is the tragedy of the commons that we should be teaching students. Finally it is crucial that we replace simplistic trade-off presentations, in which the environment is modelled as a consumer good which we buy more or less of based on income and prices. This is the standard approach embodied in ideas such as the Environmental Kuznets Curve and the Production Possibilities Frontier. Eco-systems are the basis of production, and destabilising or degrading them undermines not only economic output, but life itself. There are critical limits beyond which economic activity should not go. That is the approach taken by the Planetary Boundaries work, originally published 4 years ago, which should be incorporated into all economics teaching. I will end with a point about consumption. The core ecological principle of interconnectedness, which I just mentioned, is the crucial innovation we need to make in this area. After the Second World War, the field made a fateful decision to model consumers as independent agents with non-interdependent (independent) preferences. This feature is now at the core of homo economicus. In consumption research it led the literature into a cul-de-sac that eventually resulted in the drying up of work, because the interesting dynamics are the social ones; as the qualitative fields of sociology and anthropology discovered. It’s time to introduce economics students to homo socialus. In consumption, using a social agent means returning to concepts such as relative income and positional treadmills. (This was the Duesenberry consumption function, for those of you who remember it.) This then allows us to teach about the macro-level market failure of excess working hours and consumption. This in turn yields results such as non-optimal excess greenhouse gas emissions and eco-system degradation. As I have shown in my own work, using the stochastic version of Ehrlich and Holdren’s IPAT framework, working hours are a powerful predictor of carbon emissions, and of eco and carbon footprints. Taken together, social approaches to consumption, and material approaches to production, will allow us to make economics courses once again relevant to the most pressing problems facing humanity.